This is the first in a 2-part blog series on custom POP displays. 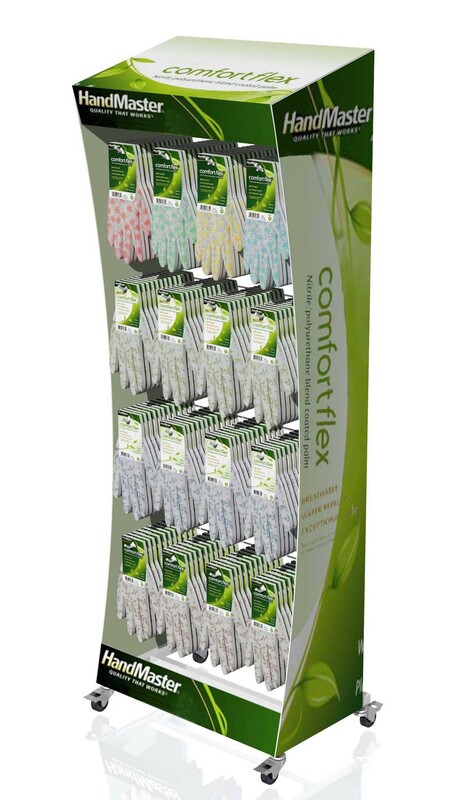 We thought it would be useful to provide 20 examples of freestanding floor displays that can work for almost any product. If you are looking for ideas for a floor display, there is a good chance you’ll find some ideas here that will work for you. 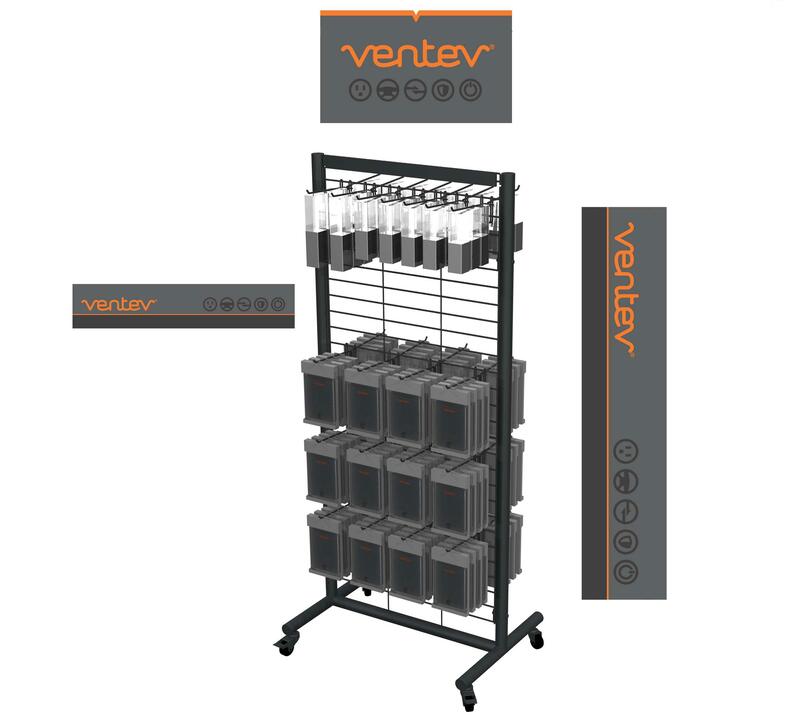 Any of these POP displays can be modified by changing the colors, customizing the signs, tweaking the accessories, or adapting the dimensions to fit the needs of a particular retail program. We’re going to start out with very basic, super affordable displays. As we get into Part II of this series, we’ll offer examples of floor displays that are a bit more expensive, but all of the examples in this series are designed to be practical and cost-effective. Our first example is a simple 1-sided floor display for hanging products. 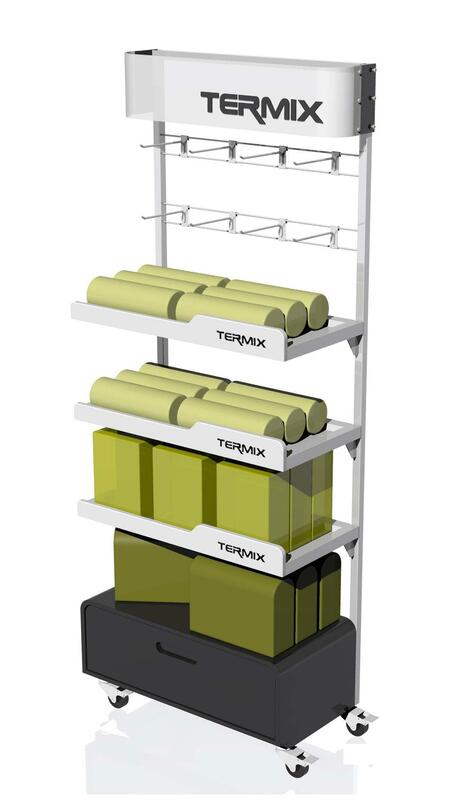 It’s very similar to a stock floor display we offer as a part of our DLXS series. 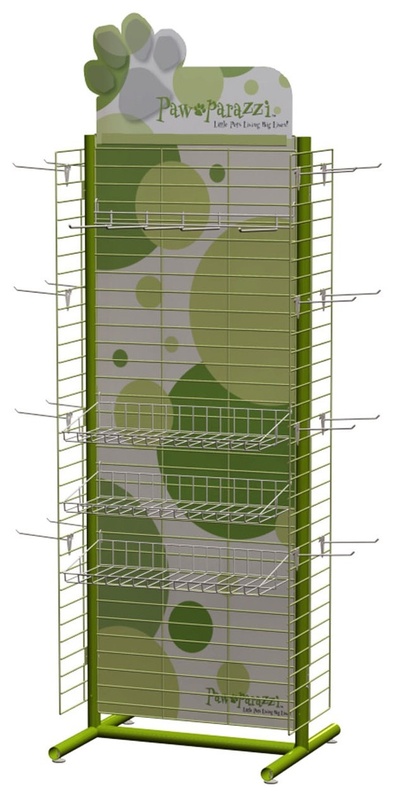 As far as floor units go, it’s hard to get more cost-effective than this display. It is constructed very simply using a metal tube base, a detachable slotted metal tube frame, welded wire hook rows, and a digitally printed 1-sided PVC header sign. 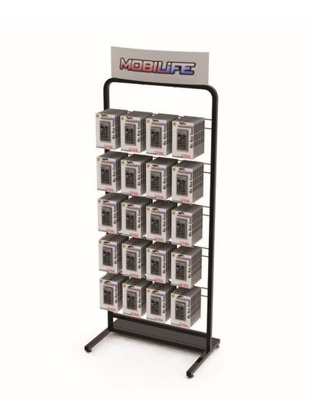 We’re showing it below with cell phone accessories, but it’s a great option for any kind of lightweight hanging product. It knocks down in a relatively flat box and is cost-effective to ship. As you can see below, it’s easy to convert this display into a higher capacity 3-sided display with the addition of wire side hook attachments. When loaded with product as shown below, you can see how this very basic display can work for many types of products and in a wide range of retail settings. Our second example is a 4-sided variation of the floor display shown above. We are showing it below with and without product. It admittedly looks a little naked without product, but from a pure economics standpoint, the minimal use of materials is what helps make this display so cost-effective. The display is constructed using a metal tube base with castors and 4 wire grids that have fixed hook rows. We added a simple circular PVC header sign for a 360-degree view. If you wanted to save even more money on this display you could replace the wheels with levelers and change the header to a flat 2-sided sign. Like the 1-sided unit, this display knocks down and ships in a relatively flat box. We wouldn’t really recommend something like this for heavy products, but it’s great for lightweight products. It’s also easy to make this display more adjustable by switching from fixed hooks to adjustable hooks. It might add a little cost, but it would increase the versatility of this floor display. Our third example is the scarf display shown below. As with our two previously discussed examples, this is a minimalist display. It’s constructed of a metal tube base, a vertical metal pole, and wire attachment hangers. It could easily be dressed up a bit with the addition of a header sign. For shorter hanging products, it would be easy to add another wire hanging attachment or two. 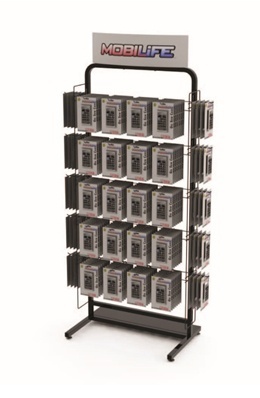 This type of display can be used for lots of hanging products that have J-hooks or hang tags. Our fourth example is very similar to our first example. The main difference is that it has a different base. This display could easily be converted to a 2-sided display by extending the base in the back. It could be dressed up further by making the base sheet metal and adding a silk-screened logo for more branding. It is shown below with and without the side hook panels. In lieu of the side hook panels it would be easy to add side signs to the display for even more branding. Our fifth example is a 1-sided glove display we made for Magid Glove to go in garden center stores. This display utilizes a similar metal tube display as the previous examples with similar wire fixed hook rows. We wanted to show this display as a way of illustrating the power of adding graphics to an economical metal display. Despite having the same basic construction as the previous examples, you can see it has a completely different look. By adding header, base, top, and side PVC graphics, the metal structure completely disappears, and the focus becomes the gloves and the graphics. The graphics do add cost to the display, but as far as graphic-intensive displays go, this is still relatively affordable. For our sixth example shown below, we wanted to show a 2-sided version of the same types of displays we have been sharing. This display is constructed of a metal tube base on castors, a slotted tube frame, an adjustable hook bar with removable hooks, and a metal sign holder. Aside from it being a 2-sided fixture, one of the main differences is that the hooks are adjustable. This feature makes it a little more expensive than the option of having fixed hook rows with welded hooks, but it makes the display more flexible. The display can also accommodate a center panel to help dress it up as shown on the right below. Seventh, the display shown below is perhaps a better example of how a center graphic panel can help create a more branded fixture. This display uses the sample type of metal tube base and frame although it was designed with round tubing instead of square tubing. It has a simple grid running between the uprights and features optional add-on side grids. 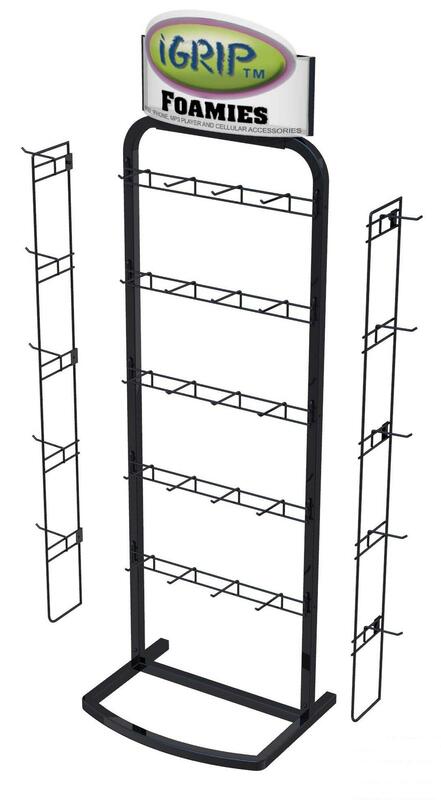 It can accommodate many types of accessories such as baskets, shelves, and hooks. The custom powder coated color helps make the display stand out along with the center graphic panel and die-cut PVC header sign. Our eighth example shares many of the common features of the displays we have been discussing, but it is a little more expensive. It’s not the metal structure that adds cost, but rather, it’s the MDF base addition, the branded sheet metal shelves, and the sheet metal header. Without a doubt, it is a more upscale display, but it still has the versatility of many of the previously discussed examples. Our ninth example is a customized version of our stock UMF display. It also has a metal tube base and frame along with a center grid panel. 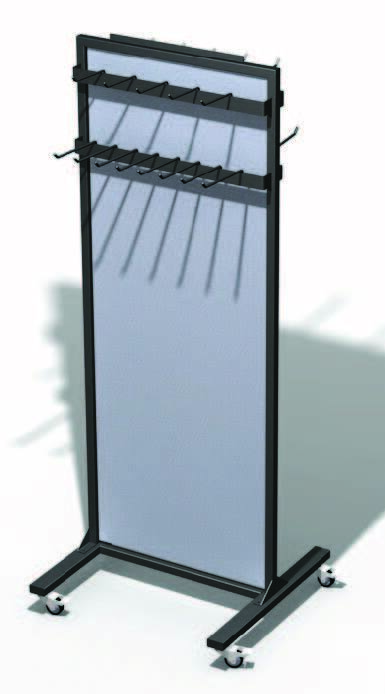 It is shown with adjustable hooks, but it can accommodate a wide range of merchandising accessories. We show below some of the sign options that can be added to the display- base, side and header signs, all of which can change the look of the display and make it a more branded fixture. Our final example is a post display we made for Wigwam. The display has a sheet metal base with a stained solid wood insert and matching solid wood branded header sign. 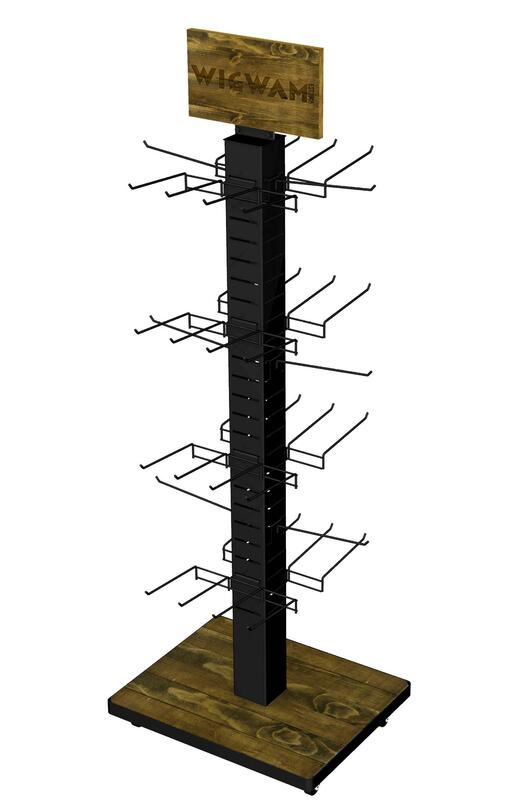 The main structure of the display is a slotted sheet metal post which can accommodate a variety of accessories. 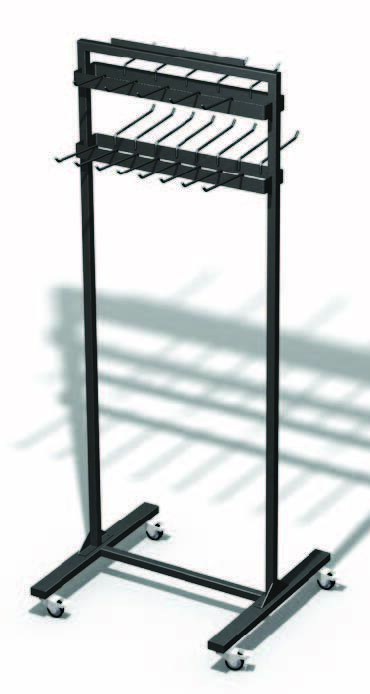 It is shown below with wire attachments for hanging socks and other apparel products. This display looks a bit higher end when loaded with product as a result of the stained wood base and header. In Part II of this series, we will show 10 more examples of custom POP displays for the floor. In the next post, we’ll move from more economical displays to displays that are considered a bit more in the mid-range pricewise.